Preheat oven to 400°F. Cut squash in half horizontally. Be careful when doing so. 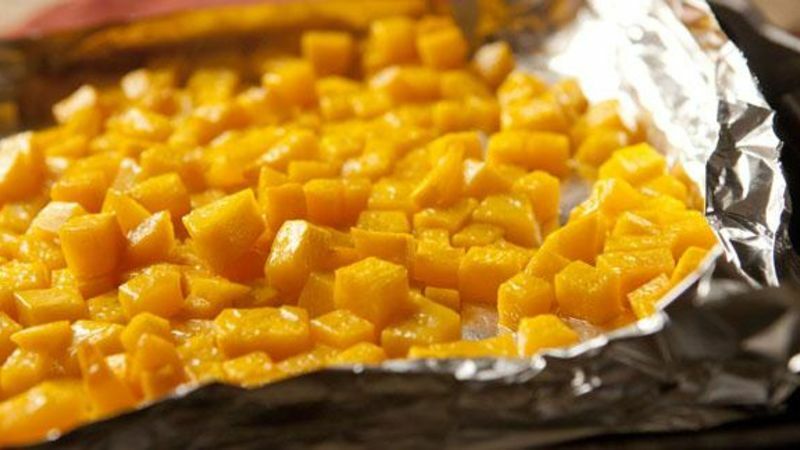 If you want to roast the squash whole, place it face down on a baking sheet lined with foil and poke some holes in the top with a fork or small paring knife. Bake the squash whole for 45 minutes at 400°F until its fork tender. Then let the squash cool and you can scoop it out and use it in recipes. To roast the squash cubed, peel squash and remove seeds and guts. Dice squash into 1/4-inch cubes. Toss with olive oil and salt. Roast cubes on foil lined baking sheet for 30 minutes, stirring once halfway through. Use roasted squash in recipes or serve as a side dish.